Hey, you got Yakuza in my Border Break! From the Tokyo Game Show comes a crazy bit of crossover news. 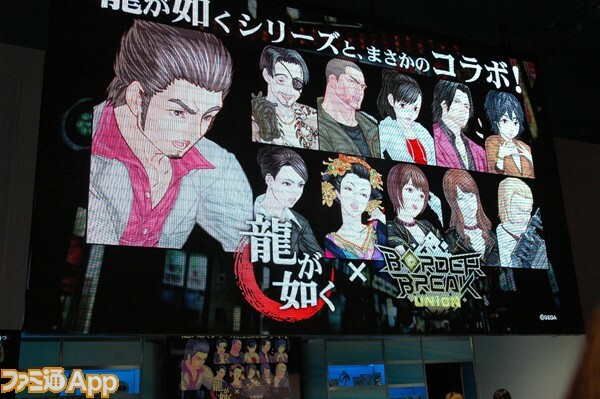 While showing off the iOS Border Break game, Gun Front Gale, and the arcade game Border Break Union (version 3.0 of the game), SEGA announced that a number of Yakuza characters will cameo in the arcade version of the game. It seems, however, that it has yet to be revealed just how the characters will be worked in. Only illustrations and the promise of cameos were revealed. As for version 3.0, 10 player co-op will be possible and the game will hit Japanese arcades on October 11th. Click here for more photos from the event. Thanks to Aki At for the tip! Kazuma looks like Phoenix Wright. … I mean, I agree! First Sakura Wars, and now Yakuza. What’s next Sonic? Sega needs to localize this arcade title proto.